Headlines, hot news, and conversation starters on January 10, 2018! Nadine Lustre has never been one to mince her words on social media and her latest Instagram Story is no different. Against a floral pattern, the Kapamilya star wrote, "Don't tell me how to live my life. You don't own me. 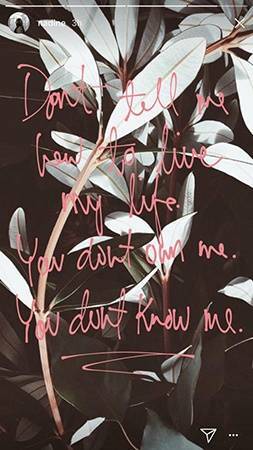 You don't know me." While it isn't known to whom Nadine is addressing this message to, one couldn't blame her to get consumed by all the hate she receives on social media on a daily basis. The only thing we could say is, Nadz, you do you. Liza Soberano lends her supports to the Autism Society Philippines with this sweet message, "Hi, everyone. My name is Liza Soberano and I want to greet you guys a happy New Year diyaan sa Autism Society Philippines. And I just want to say thank you so much for supporting me and I want to let you guys know that I'm here 100 percent to support you guys also. And kasama ninyo ako in making an Autism-OK Philippines." Tyra Banks is ~*finally*~ making her big comeback on America's Next Top Model Cycle 24. Tune in on ETC at 4 p.m. with a primetime telecast at 9 p.m.) tonight, January 10 to see the OG supermodel do her thing! We missed you, Tyra!